Stray cat fighting in the street! Actual Adult Games community · Replied to Avis in Discord? crowdforge? anything? I can't join the discord anymore? As Asset Forge is in active development there are often new releases. Could it be an easier way to get the new releases as an auto-update feature inside the application? It is a nice app but it doesn't run (< 1 fps) on my laptop using an integrated Intel card. It runs well when I activate the Nvidia card. It is surprising as the rendering doesn't seem to be too complex. Maybe the problem comes from the live thumbnails? Hello, I'm gogoprog. I'm a game programmer. No I didn't. I joined because I really like developing games and also to get more entries in my portfolio. Doom, Duke Nukem, Mortal Kombat, Command & Conquer, Total Annihilation. They inspired me all the time. Yes I do it professionaly and also as a hobby. I develop a game framework so I plan to use it in this jam. I like rock music and violent games! Restrict your project scope so you have something "finished" to submit! Have fun! Funny one and nice art! At first I wanted to do a RTS in a world full of lakes and the goal would have been to control those lakes. But as it happens in all jams the project went in a slighty different direction and in the end it is a world full of water with a few islands. 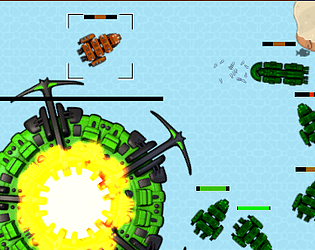 The player has a main base which is a futuristic shipyard that he has to defend and destroy the enemy's one. - The AI has been done very quickly. It is a very defensive one and will attack only if in sight. - There is some alignement issues : the credits and loading text should be in the bottom! I like the game concept, have fun! I've got the name for my entry : Fish & Destroy! Good continuation on this jam! I like both genres and I'm sure both are welcome is this jam!